TEACHERS usually frown on the folding and flying of paper aeroplanes in the classroom. But at Hillgrove Secondary School in Bukit Batok - which displays model aircraft and panels on aviation history - teachers encourage students to do just that. It is part of the school's programme in flight and aerospace, which was recognised as an applied learning programme by the Ministry of Education this year. Such programmes allow students to apply knowledge and skills acquired in the classroom in real-world contexts. These make learning lively and expose students to possibilities, which help them better choose and prepare for future courses and careers they are interested in, said Education Minister Heng Swee Keat in Parliament on March 6. Currently, 97 out of the 124 mainstream secondary schools offer one such programme. Under Hillgrove Secondary's programme, all Secondary 1 and 2 students spend one hour and 45 minutes of class time every week on aviation-related lessons. 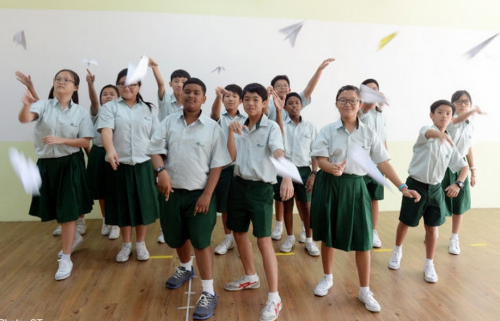 For instance, this semester, Secondary 1 students learn about concepts such as air pressure, drag and thrust through various activities, including making paper planes. Secondary 3 students can take elective modules in which they learn, among other things, to build remote-controlled planes. Secondary 4 and 5 students will mainly go for career talks and industry visits. Principal Kenneth Lee said: "We wanted to have students learn various subjects like science and maths through fun and engaging activities." This programme has its origins in the school's co-curricular activity (CCA) called the Youth Flying Club, started in 2001. Participating students get to try various aviation-related activities, including how to fly model airplanes. Over the years, students who did not join this CCA expressed interest in these activities too, so the school introduced a niche programme in 2011 to accommodate more students. The programme includes visits to aerospace facilities, career talks and space camps, where they learn about the forces of gravity and build water rockets, among other things. One in five of the school's 1,100 students is in an aviation-related CCA, such as the Youth Flying Club, National Cadet Corps (Air) and Air Scouts, which was introduced last year. Students in these CCAs learn about how planes fly through the use of a flight simulator in a dedicated flight centre, roughly the size of a classroom. Secondary 1 student Chan Zhe Ming, 13, who chose the school partly because of its aerospace niche, said: "It is not common for a school to have a flight centre and so many aviation-related activities. It makes learning fun."